For other places with the same name, see São Paulo (disambiguation). São Paulo is a state in the southeast of Brazil. It is the richest state in Brazil. It has the second highest per-capita income (lower than only the Federal District) and, with the states of Rio Grande do Sul and Santa Catarina, the highest standard of living in Brazil, despite the poverty in some peripheral parts of the largest cities. São Paulo - The large, rich and cosmopolitan capital of São Paulo, with its large number of museums, theaters, restaurant, malls, offices and annual and international events. It's one of the best cities for business tourism in the world. Campinas - A large industrial city, second largest city in the state. Ribeirão Preto - Historic city known widely as the "Draft Beer Capital of Brazil"
São José dos Campos - known as the "Brazilian aeronautics capital"
Eldorado Paulista - In the extreme south of the state, has the "Caverna do Diabo" (The Devil's Cave), on of the of the most beautiful caves in Brazil. The state of São Paulo has an area of approximately 248,800 km² (95,700 mi²), and a population of about 40 million (21.5% of the population of Brazil), which makes it the most populous country subdivision in the Western Hemisphere. The climate of São Paulo is tropical to subtropical, altitude being the largest contributor to what variation there is. The capital, São Paulo, barely outside the tropics in the south of the state and about 800 meters (2,600 feet) above sea level, has daily minimum and maximum averaging about 19°C and 28°C (66°F and 82°F) respectively at the warmest time of year and about 12°C and 22°C (54°F and 72°F) respectively at the coolest time of year. Temperatures reach around 33°C (91°F) on the hottest days and fall as low as 5°C (41°F) on the coldest nights. In the low-lying northwest of the state, temperatures average around 4°C (7°F) higher. São Paulo state is responsible for approximately one-third of Brazilian GDP. Its economy is based on machinery, the automobile and aviation industries, services, financial companies, commerce, textiles, orange growing, sugar cane and coffee production. Wealth is unequally distributed in the state, however. 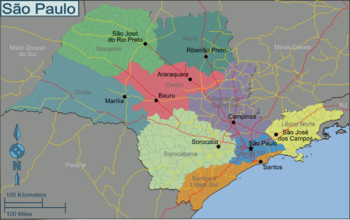 The richest municipalities are centered around Greater São Paulo (such as Campinas, Jundiaí, Paulínia, Americana, Indaiatuba, São José dos Campos, Santos, etc. ), as well as a few other more distant nucle, such as around São Carlos and Ribeirão Preto. Some regions, such as Registro and the Bananal region, in the border with Rio de Janeiro, are very poor. São Paulo has the most diverse population of Brazil. Strong immigration in the late 19th century and early 20th century brought people from all over the world to the state. The main ethnic group in São Paulo are the Italians. There are about 15 million people of Italian descent living in the state, and it is one of the largest concentration of Italians outside Italy. São Paulo always had a large Portuguese population, since the 16th century, though most Portuguese arrived in the state in the early 20th century. The Spanish population is also large, with some 7 million people of Spanish descent in the state. The Arab population, mainly Christians of Lebanese or Syrian descent are 5 million, and people of German descent are about 3 million.The population of Afro-Brazilian descent in São Paulo grew in the last decades, due to strong migration of people from northeastern Brazil, which used to concentrated most of them. People of Asian descent make up 10% of the population, most of them of Japanese descent. 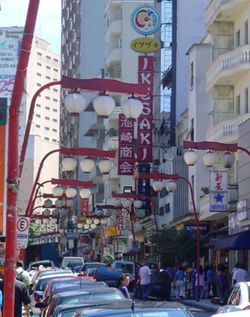 São Paulo has the largest Japanese population outside of Japan. Other Asian groups include Chinese and Koreans. São Paulo is the state with the largest system of transportation in Latin America, comprising roads, railways, fluvial lanes, airports, river and sea ports. The city of São Paulo also boasts of a metro and a suburban railway system. This page was last edited on 22 May 2015, at 19:57.